I work a 9-5 type of job so Saturday & Sunday are my days off and I tend to use them for food prep. This includes the soaking and cooking of dried beans which tend to take more time than I have to spend on dinner on any given week day. I like to buy more beans than are called for in whatever recipe I’m tackling, cook them all, and freeze the unused portion for another meal the following week. This way I get twice the bang for my single buck of time. For kidney beans I buy about a pound of dried beans, put them in a container twice as big as the bean content, cover them with water, put the lid on, and pop them in the fridge overnight. When it’s time to cook, strain the beans out of the soaking water (as it has oligosaccharides in it which were released by the beans during soaking and can lead to digestive discomfort). Place the strained beans into a pan at least twice the volume of the beans and add about ten cups of water. Bring the water to a boil, then reduce the heat to simmer and put on a timer for 40 minutes. At that point try one bean for doneness. If there’s still a tiny bit of crunch to it, let them continue to cook for a minute or two (or five- whatever it takes). When the beans are cooked to my liking I shut the heat off and add about 1/2 teaspoon of kosher salt, give them a stir, and let them sit for just a couple more minutes to absorb some of that flavor. Next, strain out the cooking water (make sure to check your recipe to see if you need to reserve that flavorful H2O) and place the cooked beans in storage containers in the fridge or freezer. This method results in a firm (I hate mushy beans!) bean with a hint of salt that is great in soups or stews or even just to snack on. If you are going to eat the beans as a side dish where they are the star of the show, rather than in a soup or stew where there are lots of other flavors coming together, consider cooking them in stock rather than in water. 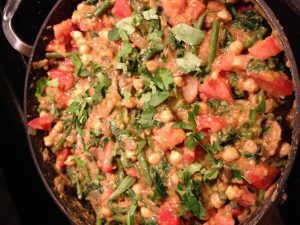 This entry was posted in All Posts, beans, gluten-free, how-to, legumes, low-fat, side dish, vegan, vegetarian and tagged beans, gluten-free, how-to, legumes, low-fat, side dish, vegan, vegetarian. In a hot Dutch oven, cook the bacon to render its lovely fat and brown the meat up. Next remove the bacon and set it in a dish to the side. Season your chicken breasts with salt, pepper, cumin & paprika and brown them in the bacon fat. At this point you need not cook them all the way through, just make them easy to chunk up. Once browned, remove the breasts and let them rest on a cutting board while adding the onion to the pan and reducing the heat, and cook the onion until it begins to be translucent. When it’s almost there, add the garlic. Add the bacon back to the pan. Cut your cooked chicken into bite-sized chunks and add it to the mix. Stir in the chicken stock, diced tomatoes, white beans, and green chiles. Salt and pepper to taste. 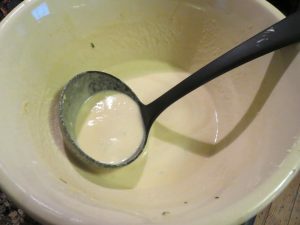 Bring to a slow boil and cook, uncovered, stirring as needed until the liquid has reduced to your level of preference. Serve with crumbles of Cotija cheese and fresh cilantro on top (and maybe a piece of bacon. Recipe adapted from Tasty Kitchen. 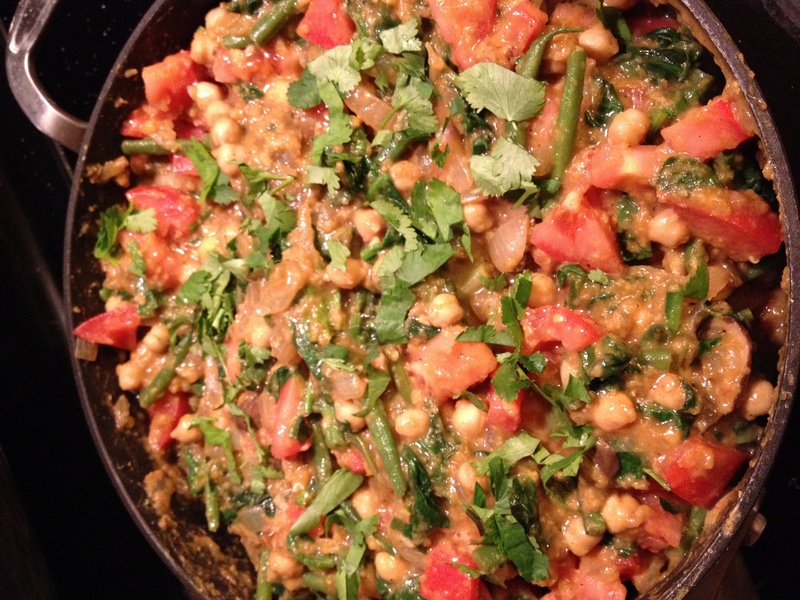 This entry was posted in All Posts and tagged bacon, beans, chicken, cilantro, entree, main dish, tomato, two sisters recipe collection. While flipping through my most recent edition of National Geographic Traveler I came across this 1-page article on Socca (chickpea flour crepes). 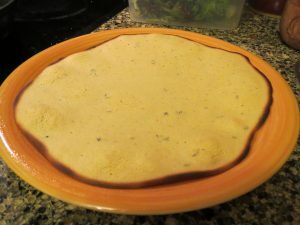 Seeing as the picture indicated that this Socca (which I had never heard of before) was a food, I decided to read on. 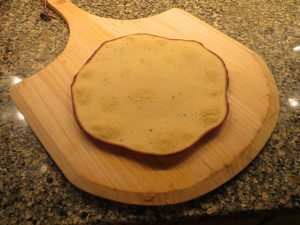 The ingredient list was simple: chickpea flour, water, olive oil, salt. The intent seemed ideal: to be in rough shards, eaten with your fingers. How could I go wrong? So I tried it. The batter is fairly thin- much like crepe. There are several options for cooking these- under a broiler (in a fry pan), on a very hot baking stone, stove top. I opted to make my first three on a baking stone, preheated in a 500 degree oven, and the last in a cast iron pan so that I could see the difference. 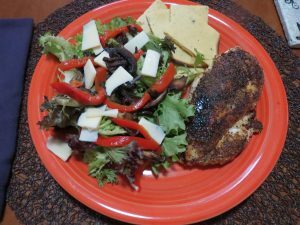 I served these as a gluten-free flatbread type of side to lemon-pepper chicken and green salads topped with crispy-fried mushrooms, roasted red peppers and cheddar cheese. This entry was posted in All Posts, appetizer, beans, bread, chicken, gluten-free, low-fat, mushrooms, primal, red pepper, salad, thyme, vegan, vegetarian and tagged appetizer, beans, bread, chicken, garlic, gluten-free, low-fat, mushrooms, primal, red pepper, salad, thyme, vegan, vegetarian. So this isn’t a recipe, but it is what I ate for lunch today. It’s low in fat, high in protein and omega 3s, and damned tasty! I was preparing pureed Lima beans for the work week to have for snacks so I used that as my base. 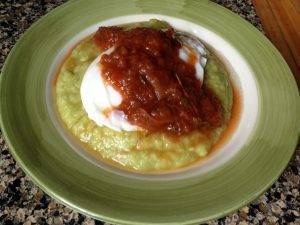 I dropped on a poached egg, and topped the concoction with a couple spoonfuls of salsa, and dug in. Wow! what flavor. This entry was posted in All Posts, beans, low-fat, salsa, tomato, vegetarian and tagged beans, eggs, low-fat, salsa, tomato, vegetarian.